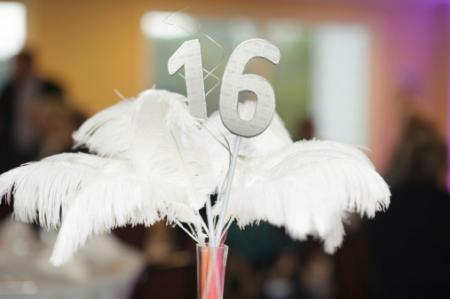 The table centerpieces for a sweet 16 should be as special as the girl who is celebrating the milestone birthday. Whether you select something that sparkles or something that matches her theme, these decorations add to the festive feel of the event. A simple centerpiece is to fill a decorative frame with printed paper and add some flower petals. Select a frame shape that fits the theme or a basic heart or star shape. Select the birthday girl's favorite colors and flowers. Purchase the frame of your choice. 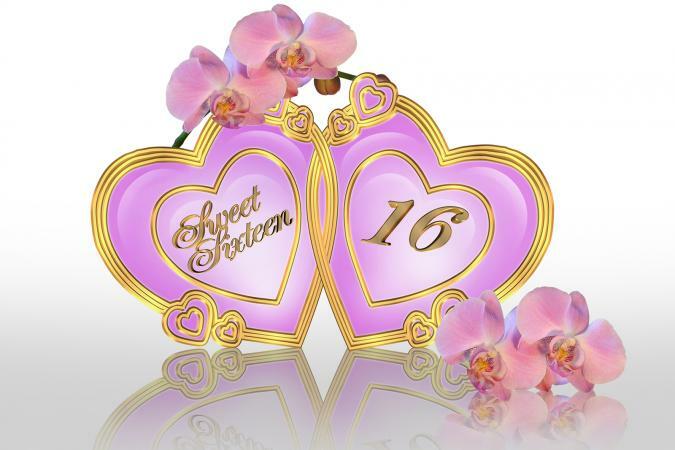 Print the words "Sweet 16" on colorful scrapbook paper and cut to fit the frames. Place the wording in the frames. Add flower petals or blossoms around the frame in the center of the table. If desired, place the frame on a small mirror in the center of the table. 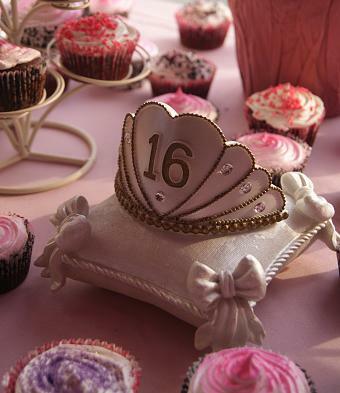 A tiara on a pillow is a perfect option for a princess-themed party. Change up the colors of the tiara, pillow, beading, and rhinestones based on the teen's preferences. Select a simple white pillow. It can be an actual pillow or a plastic decorative one. Purchase a white tiara. Add gold beading around the edges. Glue clear rhinestones in each section of the tiara. Add a gold number "16" in the center of the tiara. Place tiara on the pillow using a glue gun. A Hollywood ball or luxurious party needs centerpieces that fit the occasion. Start with a stunning vase and then add feathers to create a rich look. Pick up a tall thin vase with iridescent qualities. Alternatively, use glitter spray paint to make any vase dazzling. Fill it with bright white feathers. Add some curly fillers to the center. 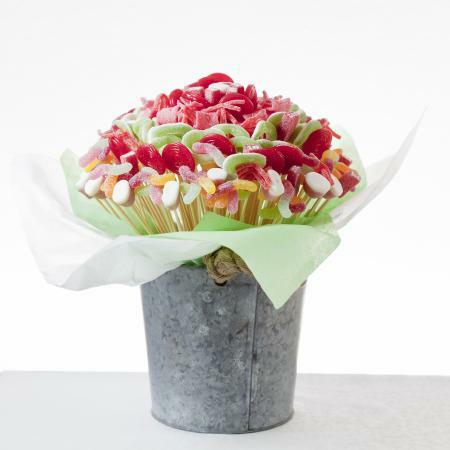 Add sticks with the number 16 to the center of the bouquet. Candyland is a popular sweet 16 party theme. Highlight this with your choice of centerpieces by making it themed to match the rest of the party. Select a bucket, vase, or pail of your choice. Line the pail with tissue paper. Slide soft candies onto the ends of food-safe wood dowels. Options might include fruit chews, soft ribbon candies, and gummies. Put the dowels into the Styrofoam base until it resembles a bouquet. Balloons don't need to be filled with helium to create a nice table centerpiece for a birthday. 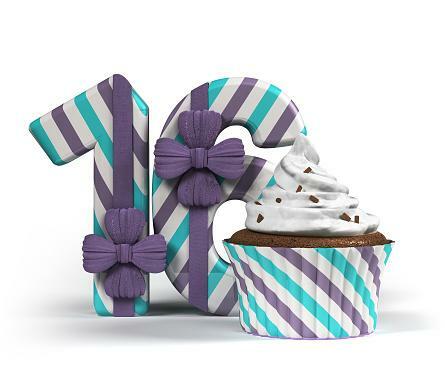 This basic option is perfect if your birthday girl doesn't have a sweet 16 theme or wants to keep things simple. Pick up a colorful pail and add a Styrofoam base. Cover the base with grass or confetti strips. Blow up colorful balloons (some can have 16 on them, some can be plain). Use long needles to attach the tied ends to the Styrofoam base. A simple way to decorate a table is to make standees of the number 16. These can be covered with wrapping paper in the design of your choice, making them quickly customizable for any theme or color scheme. Print the numbers one and six from your word processing program in a large block font. Trace the numbers onto cardboard and cut them out. Cover the cardboard numbers with your choice of wrapping paper. Add ribbon and a bow that matches your paper. Set the numbers in plate holders or glue them to clear plastic picture frames so they stand up. 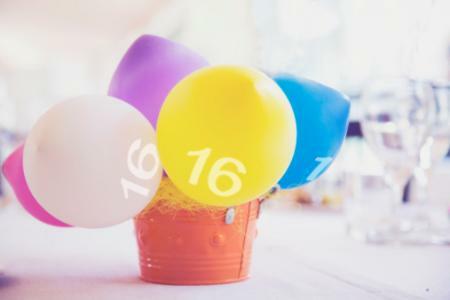 Decorating for a sweet 16 doesn't need to be complicated or costly. These quick and simple centerpieces are easy to make and can easily be customized to match the colors to your party scheme. These fun do-it-yourself options will help make decorating easy.